This is the type of training you should be doing for the MVT Rifleman Challenge, among other things. We have just brought out Tactical Fitness Training Plans, which include tabbing as a part of the tactical fitness training. British Army MTP Bergen, short back version, with ‘militaryops.co.uk’ after-market side pouches, including magazine pouches. Hill People Gear Runner’s Kit Bag. Coyote brown, on chest. Carrying Glock 26, 2 spare magazines, phone, concealed carry permit. Garmin 910XT GPS watch for time, distance and pace. Manassas Battlefield, 5.4 miles, 40 lb. 11:30 min/mile pace. good job max. keep it up. who knows, perhaps in a few years your actions may help a whole lot of people who care be in shape and on point, not just physically but the mind as well. progression. legitimate training and thinking consortium from mvt, mason dixon, s12, and mosby among a few others. I hadn’t carried a rifle long distances since basic. I started carrying a weighted bar to simulate carrying a rifle. Any concerns with doing this from a fitness stand point? I’ve been incorporating it slowly in that I don’t run with it for every run out of concern for my rotators in my shoulders. Great summary, Max. But didn’t you know that vertical videos are a sin? Tell it to Hunter! We’ll be better next time. We are knuckledraggers, not movie makers. As usual, I appreciate the way you so quickly, but accurately describe the various aspects of the training. 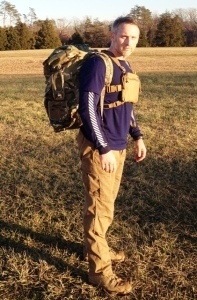 Also, having done a ruck with you..and one of your training classes, it’s obvious to me that you practice what you preach, i.e., you are fit! Can’t wait till the next class I can make. Also looking forward to the next training TAB. Very useful to see you demonstrate. Thank You, Very educational, Very useful. foot on the ground at all times). Been a while since I’v viewed the boards. Good to see all is well. Surprised in you Max, I always thought you’d sound a bit…..posher…being an ex offy and all that! Forgot to add: Yours is the sort of video that the vast majority of American gun and tactical trainers will not even contemplate doing as their too fecking lazy. I simply cannot find any other you posters emphasising the importance of PT. Went on a 4 miler sunday afternoon. 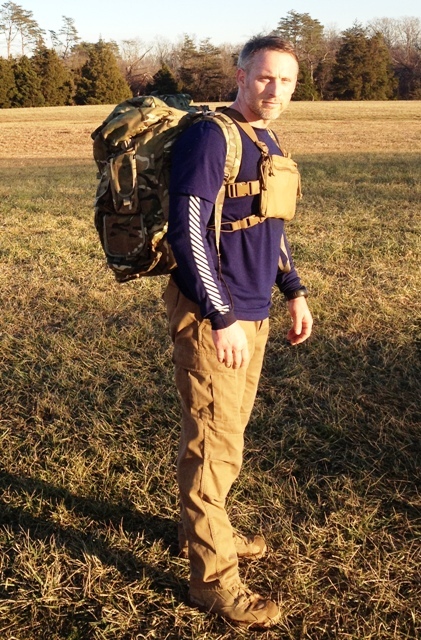 40 lb ruck. I am 43, 5’10” 210 lbs. 12 min miles were not hard at all for that distance. To get under 10 minutes would require losing my gut, but definitely doable. If I cut it down to 2 miles, then III Rifleman is possible. Great training idea. Watch out for over training with weight like that. My already bad knees (from Marine Corps days) were screaming that night.